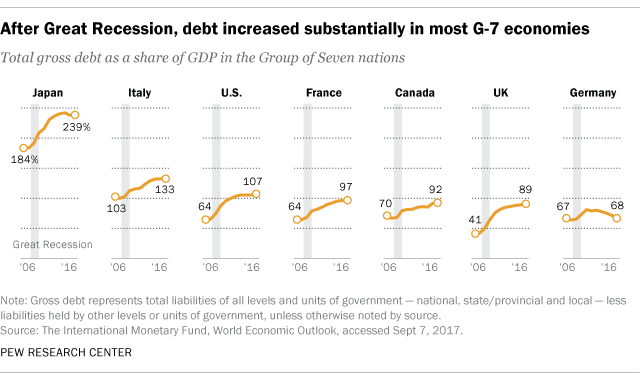 Public debt has increased sharply in many countries in recent years, particularly during and after the Great Recession. Globally, the total amount of government debt now exceeds $63.1 trillion, according to a Pew Research Center analysis of International Monetary Fund data. 2As a share of its GDP, Japan’s gross debt far exceeds that of all other nations analyzed. 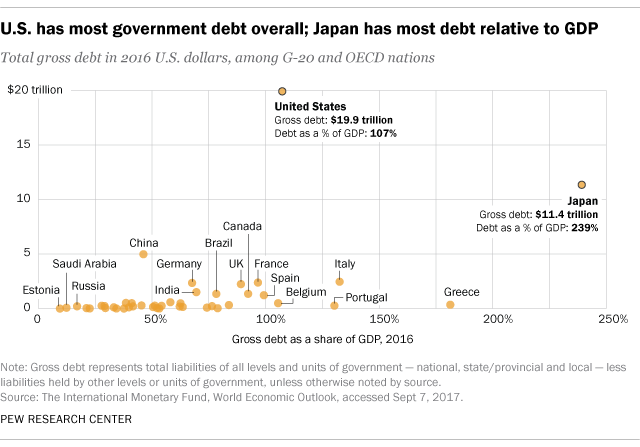 Japan’s gross public debt was more than twice its gross domestic product in 2016, far higher than the debt-to-GDP ratio of most other countries examined. Public debt in Greece, Italy, Portugal, the U.S. and Belgium also exceeded GDP. The reasons for each country’s debt load vary, but in Japan and elsewhere, an aging population has contributed. 3Norway’s GDP far outweighs its net debt. While Norway’s gross debt was 33% of its GDP in 2016, its net debt was -284.5% of its GDP. In other words, excluding intragovernmental debt, Norway’s public financial assets far exceeded its total debt. Other countries where financial assets exceeded net debt include Finland (-51.4%), Saudi Arabia (-18.9%) and Sweden (-18.3). Across the 27 analyzed countries for which the IMF has data, net public debt in 2016 was 42.9% of GDP. The country with the greatest share of net debt was Portugal, at 120.9% of GDP. Japan followed at 119.8%, but that number was half the country’s gross debt as a share of GDP. 4Brazil spends more than any other country analyzed on debt interest payments as a share of revenue. In 2015, the most recent year for which data are available, the Brazilian government spent 42.1% of its revenue on interest payments, up from 28.8% the year before. (Data for China, India, Mexico and Saudi Arabia were not available.) Debt is widely perceived as a problem in South America’s most populous nation: 91% of Brazilians said in a 2017 Pew Research Center survey that public debt is a very or moderately big problem.